Is this resort in Vietnam the best on earth? 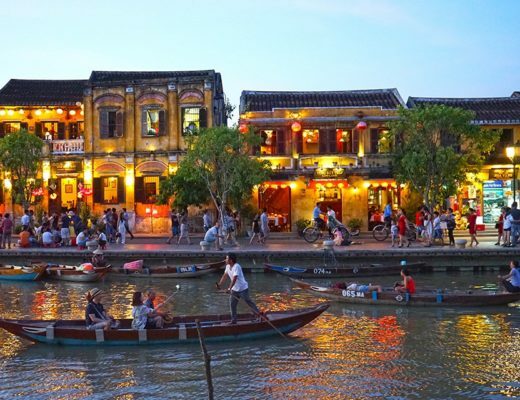 Much more than a resort in Vietnam, this is a destination, and I’m not the only one who thinks it could be the best resort on earth. Nothing can prepare you for a stay at The Intercontinental, Danang Sun Peninsula Resort, Vietnam. As far as luxury resorts go, this is as good as it gets. 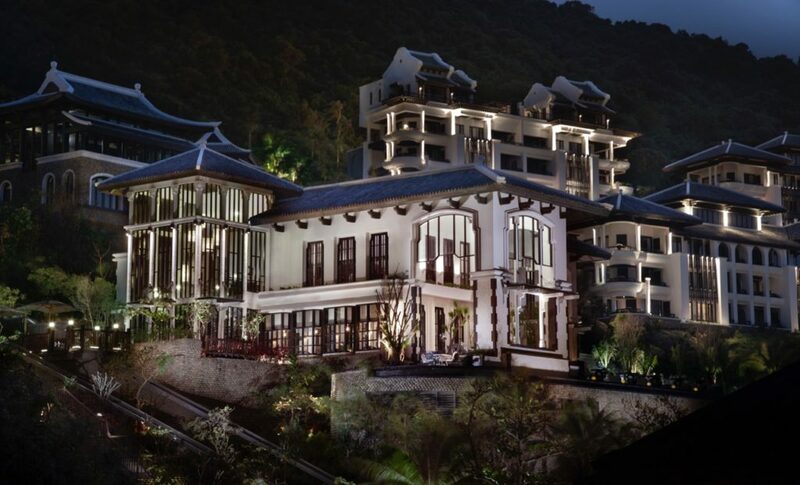 This year alone the resort was named among the top resorts in Asia by Conde Naste, and has won Asia’s leading luxury resort, Vietnam’s Leading Resort, and Vietnam’s Leading Spa Resort. 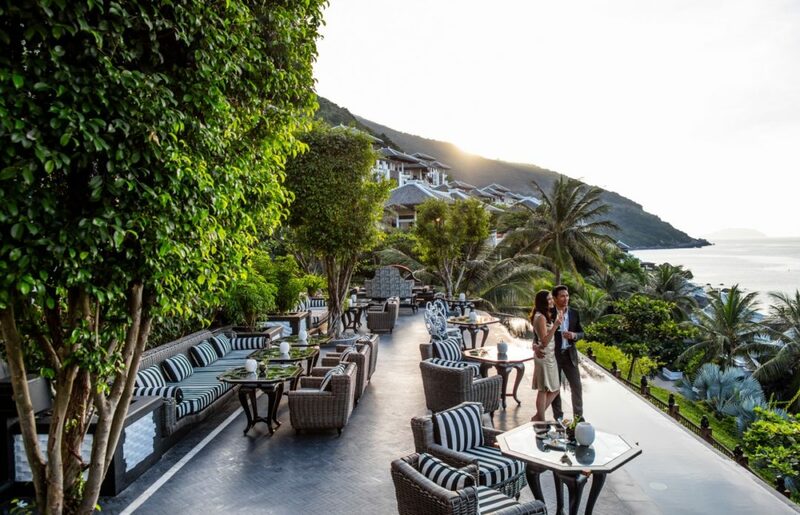 The resort is designed impeccably, with acute attention to detail at The Intercontinental, Danang Sun Peninsula Resort, Vietnam. Calling this property a resort seems somehow inappropriate – this is a destination, and one of the most magnificent natural, architectural, as well as design feats in one place I have seen anywhere. Sitting on the side of a breathtaking mountain, the construction and design is an architectural feat and cleverly encapsulates the best of nature and the lush, tropical terrain with modern, clean, progressive architectural features. It took seven years to build the Intercontinental, Danang Sun Peninsula Resort, and renowned and colourful American architect Bill Bensley has created a spectacular oasis in this beautiful part of Vietnam around a crystal clear ocean with a gleaming white sandy beach. Harvard-educated Bensley has designed over 180 properties in 30 countries since 1989. 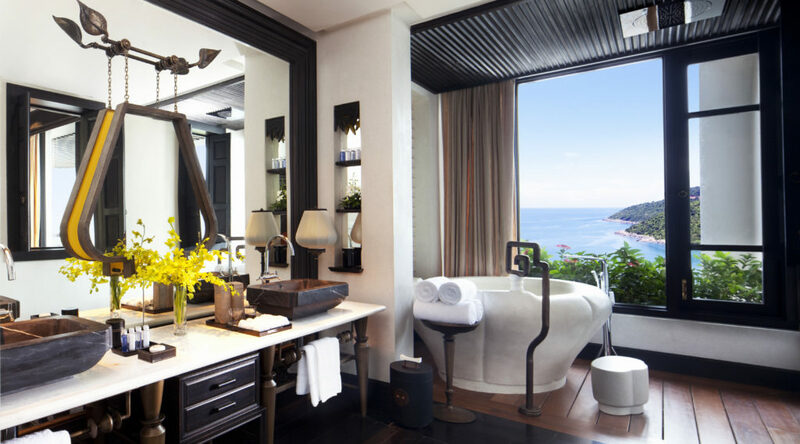 His brief at The Intercontinental, Danang Sun Peninsula Resort was to design the most ambitious resort Vietnam had ever seen, and he looks to have achieved it. My incredible ocean view classic room at The Intercontinental, Danang Sun Peninsula Resort, Vietnam. My opulent and enormous standard room was larger than most Sydney apartments, and so extraordinary in its design, look and feel, I could have happily spent my three night stay there without leaving. Not only was it beautiful and luxurious, the design was well thought through – it worked. A huge balcony overlooked the soothing, clear, blue ocean, with a large table and chairs waiting to entice me to a perfect, lazy afternoon simply reading or a spot of room service lunch. Black and white is a design theme Bensley has used throughout the property in the interiors, and each room has different black and white features. 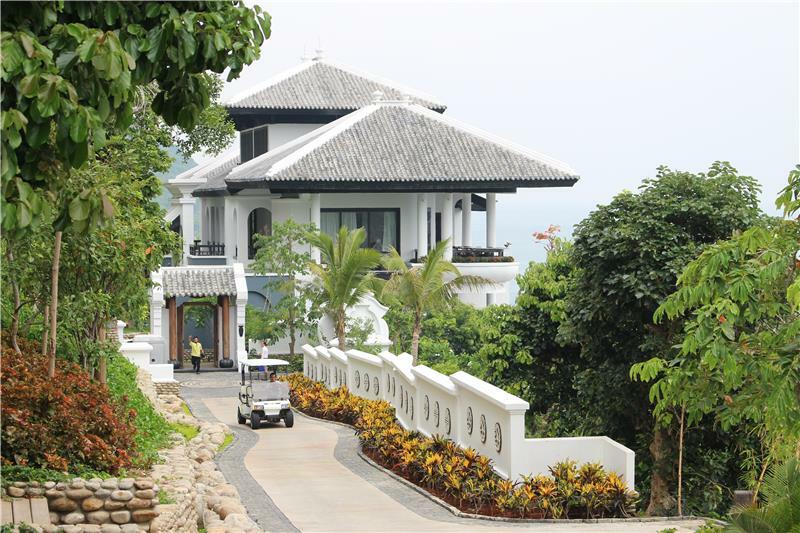 The two bedroom Royal Villa Residence by the sea is as good as it gets. The huge bathrooms have polished floorboards, massive stone baths overlooking the view that are so big you need a large stone step to climb in, and a separate open shower next to the bath where you can shower in peace and luxuriate effusively for hours – which I quite happily did. There is no excuse not to be clean here! And there’s also no excuse not to be tidy as there are huge storage cupboards to tuck your luggage and clothes away. Every single element of the hotel comes directly from Bensley’s designers, from the artwork to sculptures, the cable car and even the money statues on the walkways. This has ensured the design focus and intention is evident in every single centimetre of the resort. An elongated study desk in my room was perfect for checking e-mails, and the bedroom was quite separate to the bathroom, with more views, a king bed, and and a TV, which I didn’t bother turning on as the views outside the window – including several monkeys in the trees who visited daily – were far more entertaining. You feel as if you are sitting on the edge of the earth in these rooms; they are simply magnificent. 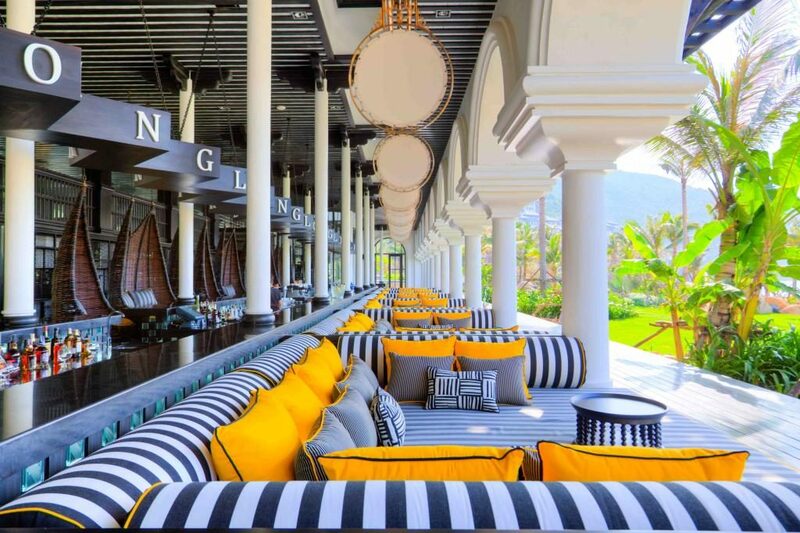 The Long Bar at The Intercontinental, Danang Sun Peninsula Resort, Vietnam. And all this before I had even set foot into the resort itself. The accommodation is in three sections. There is the main building where I stayed; there are larger sprawling villas built on the water’s edge perfect for families with a completely different feel; as well as low rise spa rooms set back amongst the tropical foliage. All have completely different designs, interiors and room offerings from penthouses with private pools to multi-bedroomed properties and even private spa treatment rooms within your own accommodation. There is just so much to choose from at this incredible resort. La Maison 1888 Restaurant at The Intercontinental, Danang Sun Peninsula Resort, Vietnam. Everything you want from a resort style holiday is here. There are five spectacularly designed restaurants, including La Maison 1888, home to renowned chef Pierre Gagniere who is based there now. The impeccably designed and staffed spa is extraordinary, and there is excellent service throughout the property. You can choose to swim in either the ocean or the jaw dropping infinity pool, or a simpler pool. One of the biggest positives about a stay here is there is so much choice. 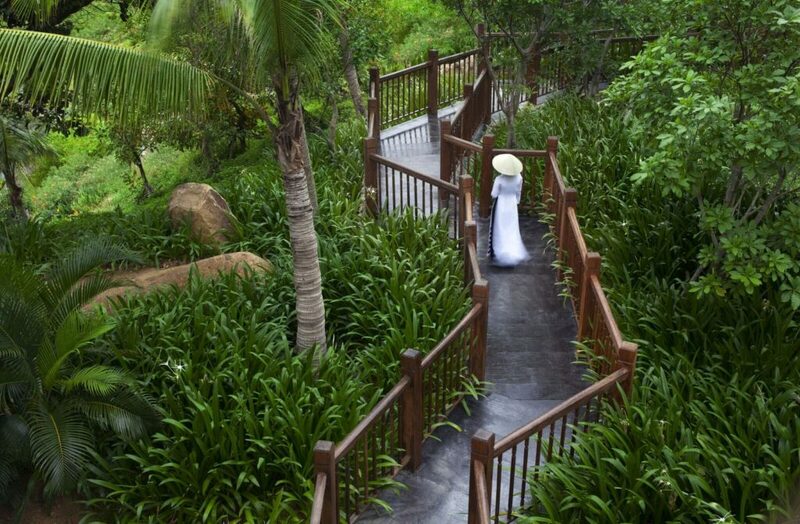 A quiet moment at The Intercontinental Sun Peninsula Resort Danang, Vietnam. And the luxury from the hotel continues even at the airport. The Intercontinental, Danang Sun Peninsula Resort even has its own lounge at the airport after customs, waiting for you after you check out of the hotel. And it has the same interiors as the hotel, as well as wines, food, service and everything else you could wish for before your flight. Talk about great marketing and care for guests. I could write 20 stories about this property – it is just so astonishing. Just go, and see for yourself.